Maggie's Journal :: "Out of the Limelight" Book Launch At Marble Mountain Community Centre on Sunday, September 21, at 2:00 - 3:00 p.m.
"Out of the Limelight" Book Launch At Marble Mountain Community Centre on Sunday, September 21, at 2:00 - 3:00 p.m.
After more than a decade of researching, a long-awaited history of Marble Mountain, Cape Breton, has been completed. 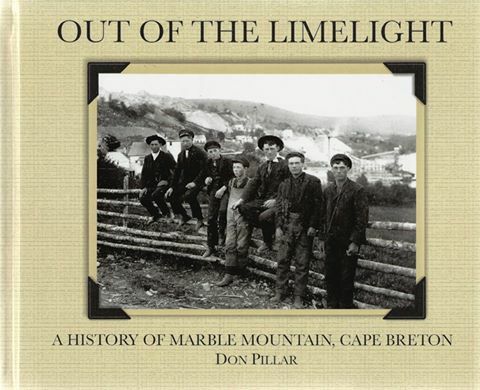 The book, Out of the Limelight, chronicles the history of Marble Mountain from its beginning as a struggling farming settlement of Highland Scots through the hectic, heady times of the early 1900’s, when Marble Mountain stood in the limelight of industry, to the present day where Marble Mountain enjoys a placid existence as a summer tourist destination. Author, Don Pillar, grandson of celebrated Cape Breton author, Margaret MacPhail (Loch Bras d’Or), will participate in a book launch at The Marble Mountain Community Centre sponsored by The North Mountain Culture and Recreation Association on Sunday, September 21 at 2:00 p.m.
Update: I just had a visit with Don Pillar and got to hold the book in my hand. It's a very nice hard cover book full of wonderful photos, lore and history, approximately 200 pages, signed by the author. Cost: $42.00 To place an order: contact Tom McCann clancydog@hotmail.com or go to the link below.